Providing job training to a person in a developing country makes a positive difference for that individual and their family. But The Adventure Project goes a step further—equipping men and women with skills to not just earn a living, but also to benefit their greater community. Working with local organizations to recruit potential entrepreneurs, TAP focuses on solving problems with a wider impact. Entrepreneurs have learned to build efficient stoves that use less charcoal—which reduces cooking costs and benefits the environment. They’ve become health care agents selling basic medicines at affordable prices. They’ve learned irrigation to help their neighbors farm and harvest food. 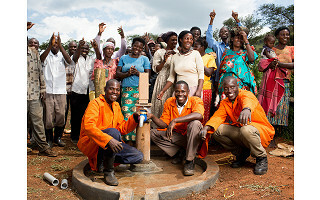 And they’ve been trained to fix and maintain wells so that locals have access to clean water. 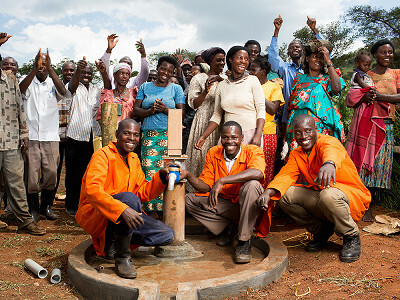 In six years, TAP has created 1,000 jobs and improved the everyday lives of over one million people. With transformative jobs that add venture capital, TAP’s exponentially good model inspired us to tell their story. Hi everyone, I am Becky Straw, Co-founder, and CEO of The Adventure Project. We train people in developing countries to be entrepreneurs in fields that provide a benefit to their greater community. What prompted you to start The Adventure Project? I had been working in international development for a few years, focused on bringing people clean and safe drinking water in Sub-Saharan Africa. One, often wells break within the first few years, because there are no spare parts, tools and trained mechanics. Over 1/3 of all wells in Sub-Saharan Africa are currently broken right now and it’s heartbreaking to watch. Millions of people are currently drinking from rivers and streams because their wells are broken. Charities drill these wells with the best of intentions - but they don’t have the foresight or business acumen to keep them working. I came to the realization that we could solve both these problems with one solution: creating jobs. By training individuals living in these communities with skills, they could earn a living as well mechanics and water caretakers. We decided to call ourselves, The Adventure Project because we are supporting ventures that add something positive to the world. You focus on targeted solutions in creating jobs and helping communities, how did you develop that model and is it something that you've refined over time? My Co-Founder and I knew the issues with water, but we quickly realized these business models also can apply to solving other social problems. So we began expanding our portfolio to include jobs that target health, hunger issues, and the environment. One of the coolest parts of our portfolio is we’re realizing no matter what job is created, moms and dads spend their money on the same things: they buy more nutritious food for their family and they send their kids to school. We love saying that we are not an education nonprofit, but over 1,000 kids are now enrolled in school . It’s not because we have sponsored them - it’s because their parents now have the income and ability to send them. How have the communities you've worked with responded to resources and opportunities you've helped provide? We like to say that charity helps for today, but a job transforms tomorrow. And that’s really what we’re seeing in these communities. One of my favorite stats is from our health care partner, Living Goods. They uncovered that just having one community healthcare promoter in a village will reduce child mortality by 27%. That’s incredible! On average, it takes $1,500 to provide the job training, mentorship and support to create one job. But that job ends up serving over 500 people with critical, life-saving services. It’s truly maximizing impact, and leaving communities better off in the process. There’s a sense of ownership and pride that I have never seen before. Providing job training to a person in a developing country makes a positive difference for that individual and their family. But The Adventure Project goes a step further—equipping men and women with skills to not just earn a living, but also to benefit their greater community. Working with local organizations to recruit potential entrepreneurs, TAP focuses on solving problems with a wider impact. Entrepreneurs have learned to build efficient stoves that use less charcoal—which reduces cooking costs and benefits the environment. They’ve become health care agents selling basic medicines at affordable prices. They’ve learned irrigation to help their neighbors farm and harvest food. 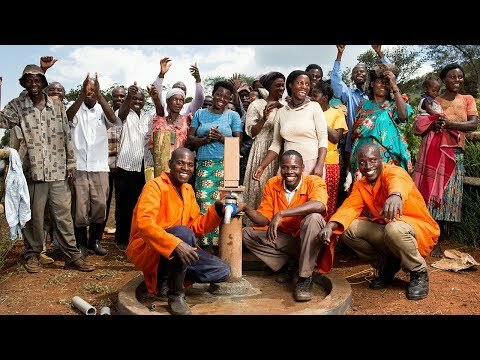 And they’ve been trained to fix and maintain wells so that locals have access to clean water.